Just when I thought I had seen enough. Just when I thought I couldn't anticipate 'Suicide Squad' more than I already do. What does Warner Bros do? They blow out Hall H at San Diego Comic-Com with a 3-minute extended trailer remixed with music from the soundtrack. See it below. August 5 cannot be here fast enough. With even more footage and more details about what this group of supervillains are up against, the Suicide Squad trailer is probably the best one we've seen. It features three songs from the movie's soundtrack- "Heathens" by twenty one pilots, "Sucker for Pain" by Lil Wayne, Wiz Khalifa & Imagine Dragons, and "Purple Lamborghini" by Skrillex and Rick Ross. (Check out the music videos below). Intelligence officer Amanda Waller (Viola Davis) decides to assemble a team of dangerous, incarcerated supervillains for a top-secret mission. 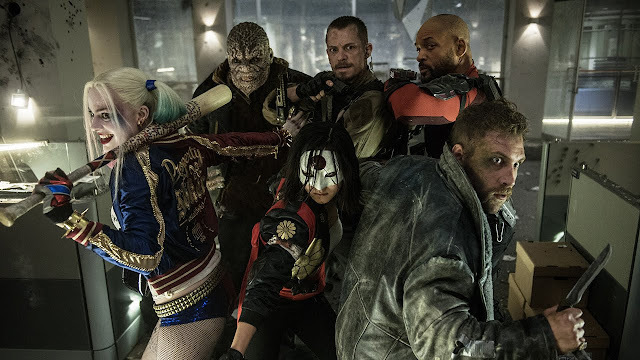 Figuring it has nothing to lose, the U.S. government supplies weapons to Deadshot (Will Smith), Harley Quinn (Margot Robbie), Captain Boomerang (Jai Courtney) and other despicable inmates. Dubbed the Suicide Squad, the united criminals must defeat a mysterious and powerful entity while contending with the antics of the diabolical Joker (Jared Leto).